I am all about knitting something that I can finish quickly at the moment. I just want something in some area of my life to be a relatively easy win. Hence, I cast on this hat using some of the yarn I bought at Bristol Wool Fair. It's from an old issue of Vogue. It has an interesting construction - you knit the brim and then pick up for the crown. So far so ordinary but the brim is pretty interesting. It is clever - the twisted rib pattern on the narrow strip makes the fabric bias so it curves naturally around the head. I was knitting it at breakfast with my friend Phillipa. "You've knitted a spoon!" she said, when it was just a strip with one cabled oval. Now I fear it looks like a knitted reproductive system, but maybe that's just the colour. 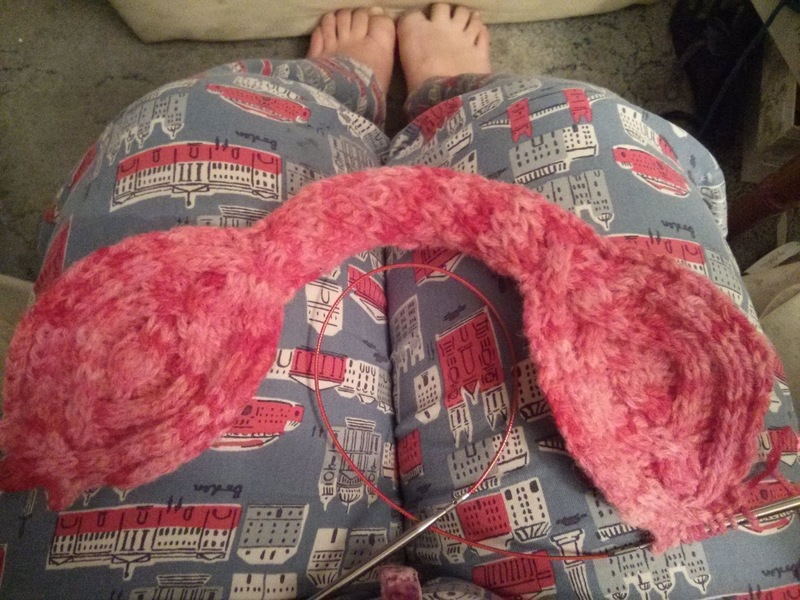 Since I took this picture I finished the brim and sewed it up; it looks a bit less ovarian now. I'm intending to add the lovely gold rose button I bought at Wonderwool a couple of years back. Actually, the button inspired the whole hat.